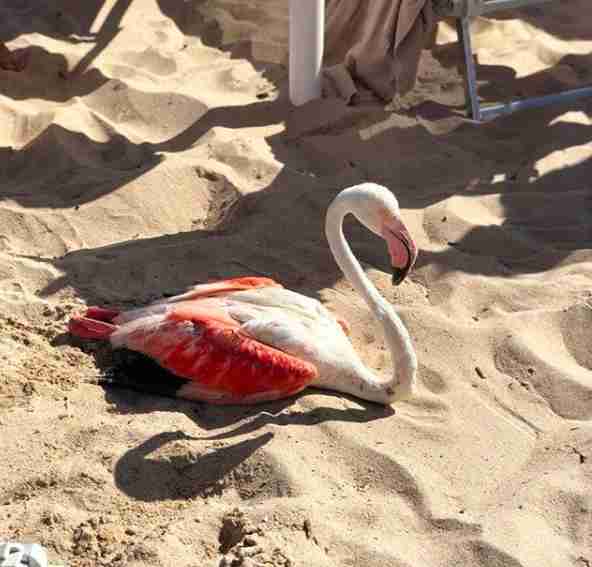 Franco Guicciardi works as a surf instructor on a beach in Italy, and was gazing out at the ocean one day when he noticed some sort of animal drowning in the water — and quickly realized it was a flamingo. Guicciardi felt for the poor bird and immediately knew he had to help, so he and his friend grabbed a surfboard and paddled out into the ocean. 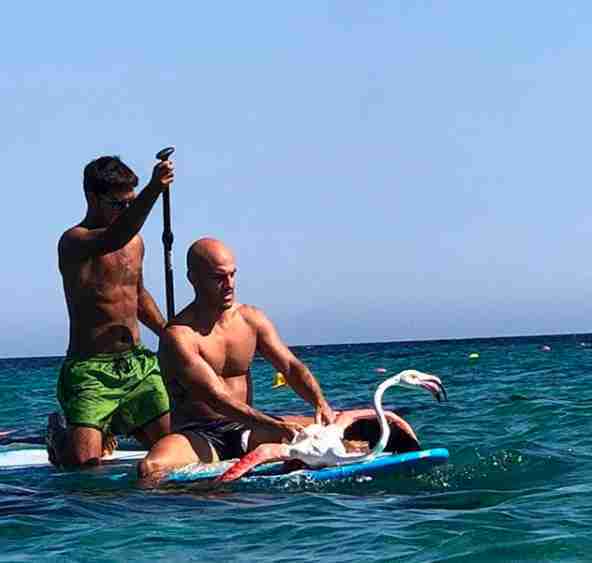 As soon as they reached the flamingo, they quickly saw that there was no way he could make it back to shore on his own, so they pulled him onto their board with them and began to paddle back to dry land. 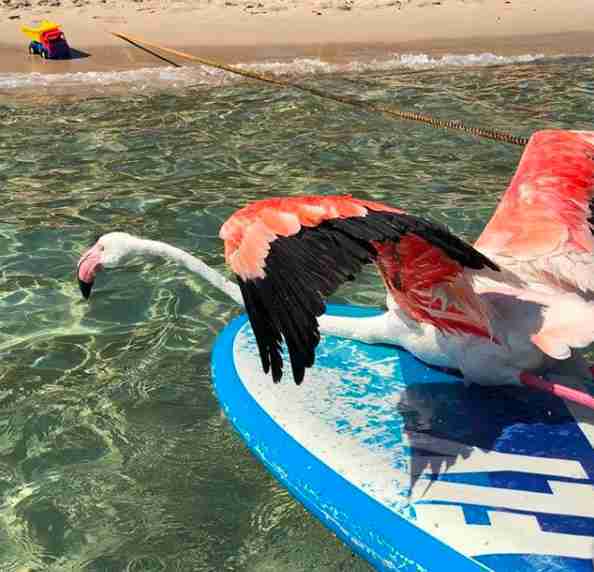 The flamingo sat on the front of the surfboard with his wings spread out as his rescuers paddled, just trying to catch his breath. “The animal was exhausted due to strong sea currents and wind,” Guicciardi wrote on an Instagram post about the rescue. As soon as they reached the beach, Guicciardi contacted the local forest patrol, who put him in touch with the Clinica Veterinaria San Giuseppe. 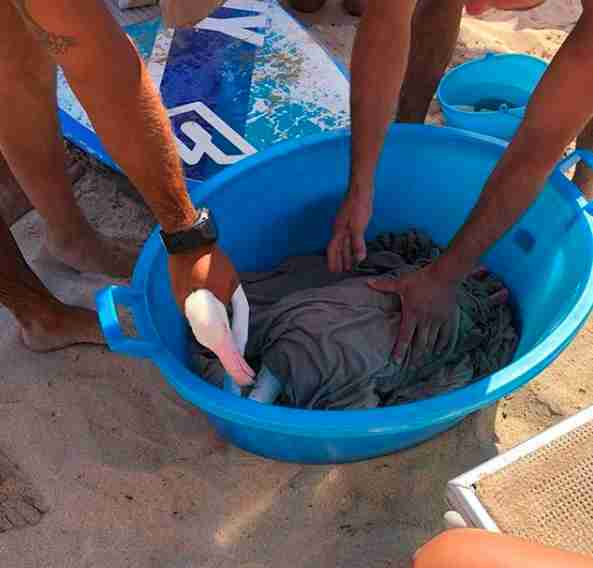 A vet there instructed him to place the flamingo inside a bucket with damp clothes or towels in order to keep him safe while he was being transported to the clinic. … who seemed to feel very safe once he was snuggled up inside the bucket. Once he was cozy and secure, Guicciardi rushed the flamingo to the clinic. After checking him over, the vet assured Guicciardi that in a matter of days the flamingo would be completely healed and back out in the wild again. 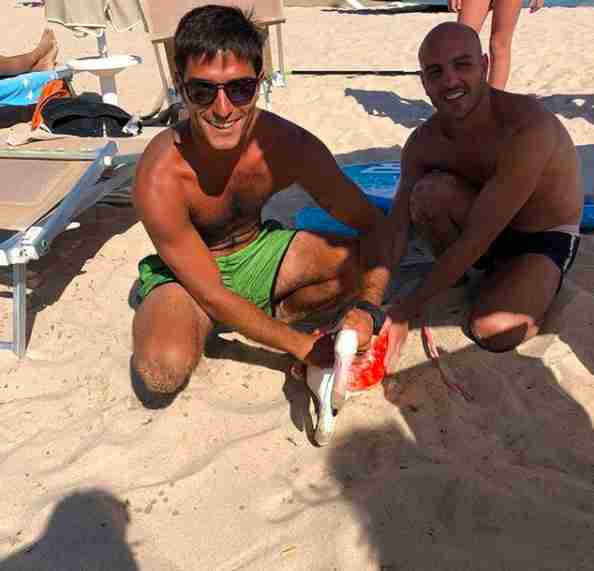 Thanks to Guicciardi and all the kind people on the beach that day, the flamingo is now healthy, happy and back in the wild where he belongs. “Thanks to those who contributed to this positive action,” Guicciardi said.